Hope you’ve all had a corker of a weekend. Have I mentioned before that i do struggle to pull myself together on weekends? Dressing everyone (apart from hub’s) means I’m left to quickly chuck something on or go out in my pj’s. And even though this small town i live seems to be ok with going out in pjs and joggers constantly(honestly, its a very small town) but that just wouldn’t be me… as easy, comfy and appealing as it may seem sometimes! i never was one for an easy life 😉 So leggings… I think leggings are like marmite… you either love them or hate them. i am a fan as no ironing or pressing is required. straight away that’s a thumbs up from me. 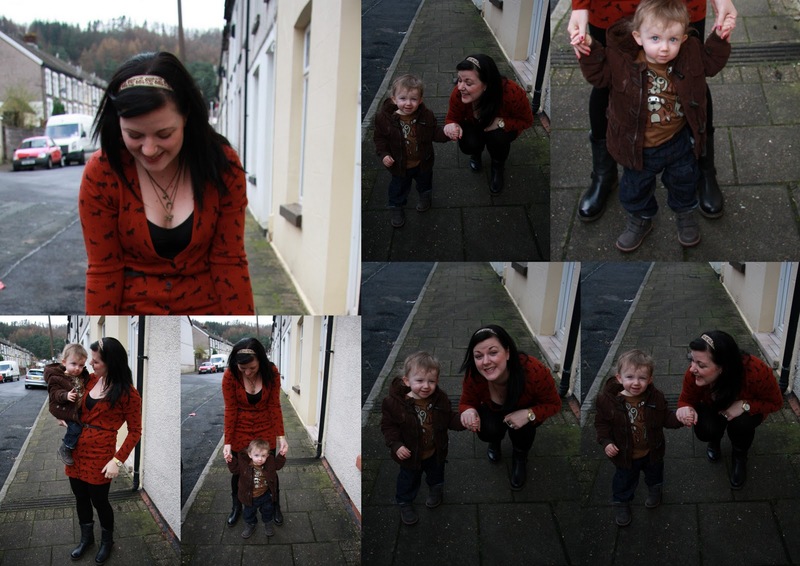 I also couldn’t resist showing you some of these lovely pics of my ever growing Neo.. he so funny…. a handful but funny. So number 1. Thank you so much Welsh Wales Mam, you made my day! And seriously you guys should go see her…. her son is adorable!!! 1. Rhiannon from Pretty Petal Handmade ok, this may be a bit naughty (but hey there’s nothing in the rules) but this is my lovely lovely sis! She is a crafty lil fox and is having a massive giveaway on her blog at the mo.. so if you like felty fabrics and free xmassy stuff, go see her. Plus she’s lovely. 2. This lovely lady is also very skilled and a very good friend. Twinkles, Tutus & Twirls.. if you have little girls, you should go see her as she can make that little lady in your life very happy with wands, tutus and all things lovely. 4.Black and white and loved all over is a lovely blog by a lady called Ellen, full of stuff she’s made, worn,loved. And her daughter Tessa is gorgeous. 5. A flattering Tale is a very lovely fashion blog from accross the pond. I love her style! So thats it!! an eclectic mix of fashion, crafts and motherhood! Hope you enjoy checking them out. and thanks again fellow Welshy, Welsh Wales Mam! love leggings and love that cardigan! such cute photos! Such cuties and you look like one hot mommy in your red dress.